Friends of the Chinatown Library seeks to hire a Start-Up Manager for a Chinatown Cultural Center. Our vision is to develop a community-based cultural center and multi-purpose space with library, cultural, and community programming. The Start-Up Manager will be responsible for all facets of project start-up, including developing partnerships, fundraising, working with The Chinatown Coalition’s Project Coordinator to oversee the build-out of the facility, program development and implementation, and volunteer recruitment and management. $35,000 to $40,000 for one year, commensurate with experience. Full-time position with benefits. Interested candidates should email resume and cover letter by July 20, 2011 to cynthia.wong@bcnc.net. Please indicate position interested. (Tisch Scholars) Program. Submitting a proposal will allow your project to be considered for the assignment of a Tisch Scholar to work with your organization for 6-8 hours per week during the academic year. The Tisch Scholars Program is a highly selective leadership development program in active citizenship for undergraduate students at Tufts University. Tisch Scholars work in the community on projects at nonprofits, schools and government agencies. We are looking forward to another year with engaged Scholars, outstanding community partners and strong projects. As you develop your agency’s Tisch Scholars project proposal, consider ways that Tisch Scholars can partner with you on particular initiatives within your organization and/or broader community. An ideal Tisch Scholar project addresses a community identified need, has clearly identified goals and desired outcomes, and is a learning and leadership opportunity for the student. We will review all project proposals received by the deadline of June 27. Projects that match the Tisch Scholars program criteria (see attached program description and detailed criteria) will be placed on a “projects menu” that will be sent to first year Scholars. The Scholars will rank their project options, and based on what we know about each partner and student, Tisch staff will facilitate a match in late summer. Once projects are matched with Scholars, you will be informed regarding if your project was selected. If it was, you will be given the student contact information and more detailed program information, and the student will be given the project supervisor’s contact information and instructions to be in touch at the start of the fall semester. If your project was not selected by a Tisch Scholar, Tisch staff will work with you to facilitate an alternative means for Tufts student involvement. All first year Tisch Scholars are sophomores who were selected for the program in the fall of the freshman year from a large pool of applicants. Criteria included previous civic engagement in high school; leadership skills and potential; and dedication to social change. In the spring, each student completed the program’s foundation course, “Education for Active Citizenship”. I, along with other Tisch College staff will work with you to insure the success of the project for both you and the Scholar. I have included a template for you to submit your Tisch Scholars project proposal for inclusion on the project menu. I have also attached a listing of the first year Scholars who will be selecting projects from the menu and their interests. This list may serve as an inspiration for you as you develop a potential project, or you may choose not to utilize it at all. If you have any questions about this project proposal process, feel free to contact me at sara.allred@tufts.edu or 617-627-5666. Thank you for your partnership in this process. Boston MA – On Thursday July 14, U.S. HHS Regional Director Christie Hager, CMS Boston Regional Administrator Jaye Weisman, MA Elder Affairs Secretary Ann Hartstein and Peter Chan, Regional Manager of the Office for Civil Rights, will participate in a presentation for Chinese Elders about preventive services that are now available to Medicare beneficiaries thanks to the Affordable Care Act. Hager, Weisman and Hartstein will also be joined by USDA Food and Nutrition Services Registered Dietician Heather Healey who will discuss MyPlate to help consumers make better food choices. Late last week, the state Legislature passed a final FY12 budget, which now awaits a signature from Governor Patrick. While there is some positive news from the Legislature, the threat of vetoes from the Governor pose a major risk to funding, and we need your help to tell Governor Patrick to support public health funding. The Legislature’s budget would fund the Department of Public Health (DPH) community-based programs $28 million higher than proposed by Governor Patrick in his January budget proposal. The Governor has the power to veto or reduce individual lines items in the state budget before he signs it, and we expect that the Governor will consider significant reductions to the DPH budget. The Legislature also passed a rider to the budget (Outside Section 197) that would amend the state’s smoke-free workplace law and forbid the state’s three largest cities – Boston, Worcester and Springfield – from banning cigar bars. Cigar bars glamorize smoking at a time when more Massachusetts youth smoke small flavored cigars and use smokeless products than smoke cigarettes, and we must protect the authority of our local public health officials to craft sound local tobacco policy. Last year, the Governor vetoed a similar provision. Please take a few minutes to contact Governor Patrick today and tell him to support the DPH budget on his desk and to veto Outside Section 197. See below for more information about the DPH budget and programs at risk for funding reductions. Compared to the cost of maintaining services at last year’s levels, the Legislature’s budget would cut DPH funding slightly, by about 1%. However, the overall numbers mask several deeper cuts that are cause for concern. Click here to read more about how selected DPH programs fared in the budget. Women, Infants, and Children (WIC) Program (line item 4513-1002) at $12.4 m. WIC provides services to pregnant and parenting women and children under 5, including financial support to purchase food, nutritional information and consultations, health insurance, child care, housing and fuel assistance, and other services that can benefit the whole family. WIC is effective in protecting young children’s health and development, and according to Children’s Health Watch, every $1.00 spent on WIC results in savings of between $1.77 and $3.13 in health care costs in them first 60 days after an infant’s birth. Department of Public Health Essential Services (line item 4510-0100) at $15.9 m .Further cuts to this line item would result in a loss of up to 50 staff positions across DPH and would have a devastating impact to the services that DPH provides, including emergency preparedness, environmental health assessments, implementation and enforcement of regulations, reducing disparities in health care, and monitoring and inspections of nursing homes, food safety, and water quality. Funding has already been cut by over 20% in the past three years. Health Promotion and Disease Prevention (line item 4513-1111) at $3.5 m .This funding supports effective programs to improve community health and increase access to screening, outreach, and care coordination, which helps reduce health care costs and has a unique role in prevention that cannot be replaced by clinical services and health insurance coverage. These programs include cancer screening, stroke prevention, and state funding for Mass in Motion grants that are currently funding 14 communities as part of the state’s signature obesity-prevention initiative. Funding has already been cut by 60% in the last three years. Thank you for your support of public health funding! For additional information, please contact Maddie Ribble at 617-524-6696 x111 or mribble@mphaweb.org. 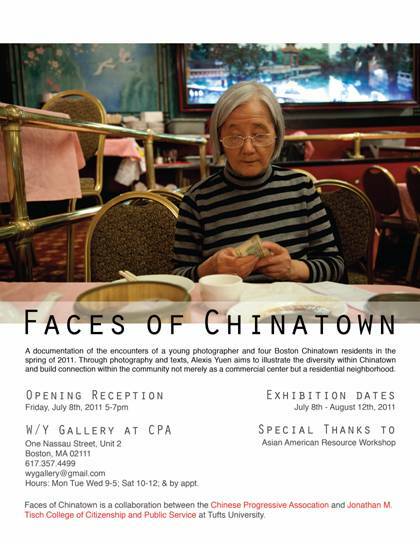 A documentation of the encounters of a young photographer and four Boston Chinatown residents in the spring of 2011. Through photography and texts, Alexis Yuen aims to illustrate the diversity within Chinatown and build connection within the community not merely as a commercial center but also as a residential neighborhood. Hours: Mon Tue Wed 9-5; Sat 10-12; & by appt.